A simple to use, web-based way to manage your purchase to pay process, P2P One extends your purchasing capabilities by automating and streamlining each stage of the purchasing cycle in real-time. The cloud application integrates with SAP Business One, unifying the complete procurement process and enabling rapid user onboarding. Designed to control and track company-wide spend, P2P One encourages departments to be more efficient with their time and delivers year-on-year savings. The web interface of P2P One provides users with on-demand access to manage each stage of the purchasing cycle instantaneously. With all procurement processes in one system, the creation of documents such as purchase requisitions, purchase orders, and supplier invoices can be accessed and tracked through the approval system. P2P One enables a unified approach to purchase management. With our solution, you are able to move away from legacy software and disparate systems to gain end-to-end purchase to pay control of your business commitments. Eliminate costly maverick spending from across the company, while gaining the ability to monitor all purchasing activities. P2P One is a cloud application that is fully integrated with SAP Business One. It uses underlying master data such as suppliers, items, cost centres, etc. to extend purchasing functions throughout the business without the need for additional SAP Business One licenses. The synchronicity of the systems enables rapid deployment, while the simplicity of the system means quick user onboarding. The cloud application is designed to handle all purchasing processes and encourage departments to be more efficient with their time. P2P One has the ability to control and track company-wide spend, delivering excellent ROI benefits to your business. Our P2P One technology brings all procurement processes into one, easy-to-use system. 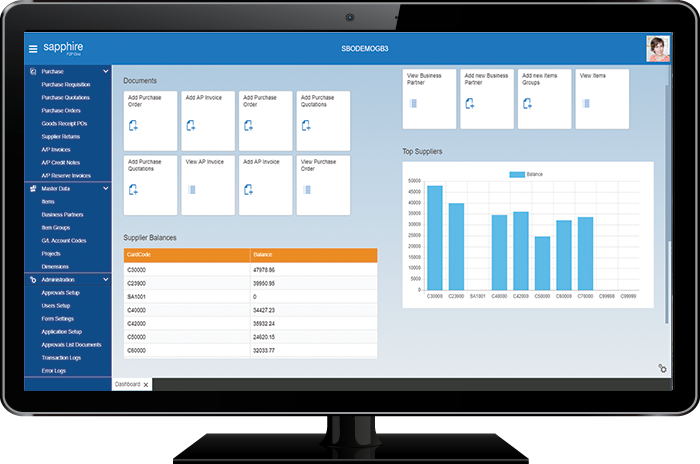 Learn how the features of the solution can transform your business’ purchase management.